France is a country for foodies. It’s a fact. Indeed, French gastronomy has been recognised by Unesco as a ‘world intangible heritage’. 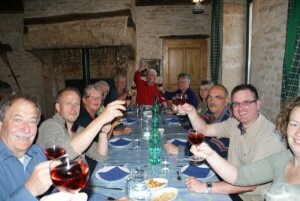 Eating and drinking, en famille or amongst friends, it’s a ritual developed over generations, an active tradition and a social custom for which the French are renowned. The good news is that you will find this reverence for gastronomic tradition alive and well in guest houses across France. It’s heartening to see bed and breakfast owners offering their guests a little slice of their own very special corner of France. The ‘table d’hôte’ or ‘hosts’ table’ is generally an unhurried affair, with each course savoured and enjoyed. Local or homegrown and largely organic produce features heavily on the menu and, in the vineyard areas of France, local wine on the table is ‘de rigueur’. The thing about fantastic food in France is that it doesn’t have to be complicated and it doesn’t have to be expensive. Indeed, some of the best, the very best food in France is good old traditional home-cooked fayre created from home-grown produce. Many B&Bs in France have their own potager or kitchen garden and maybe even an orchard which supplies the kitchen year round not only with the freshest vegetables but also with a huge variety of fruits. Recipes have quite often been handed down through the generations, maybe tweaked a bit here and there, but always true to their roots. 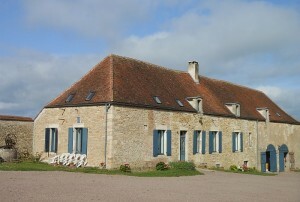 Elisabeth at her farmstead B&B in Burgundy is of this ilk. All her vegetables are home grown as far as possible and the animals that produce the meat (rabbits, chicken, duck) are all raised on the farm. Traditional Burgundian dishes feature heavily, but the emphasis is always on simplicity and authenticity. That’s the way things are done here. 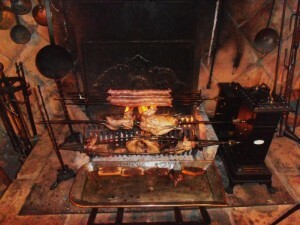 Traditional methods such as cooking over an open fire are still used by those B&Bs lucky enough to still have an open hearth. This is how it was done in days of olde before contraptions such as cookers were invented. Even more up-market addresses such as this boutique B&B in the Loire Valley are proud to embrace such methods when cooking for their guests. 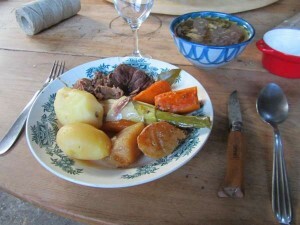 Many expatriate B&B owners in France have also embraced the gastronomic traditions of their adopted homeland. Good food and wine are an integral part of life in France and for many, it was a fundamental reason for their decision to start their new life here. Imaginative, thoughtful, seasonal dishes are found on many a hosts’ table and some, such as this boutique B&B in Normandy have gained an enviable reputation for the quality of their fayre. Leslie’s four course gastronomic evening meals feature home grown and local produce sourced from local farms and markets, accompanied naturellement by carefully sourced French wines at very fair prices. But it’s also the breakfasts here that get special mention from guests. Eggs are laid by her own ladies cooked to your wishes and homemade jams and marmalades, freshly squeezed orange juice, fresh bread, cakes, croissants will be on the breakfast table. So if you are staying at a B&B in France this summer, make sure you will be arriving in time to enjoy one of these eating experiences. My only other advice to you is just make sure your belt has a few spare notches! !